I'm back with my card for Mojo Monday week 169. Here's the sketch. I used dp by Webster's Pages (a combined collection called Waiting for Santa and Sweet Season) along with a little olive green for matting. 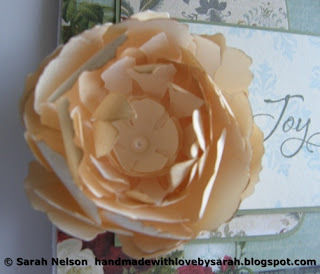 I replaced the circle element in the sketch with a flower that I made with a Sizzix Tim Holtz Tattered Florals die. I am loving this die! It is so easy to use, and I'm getting faster/better at making the flowers. I inked some of the edges with Vintage Photo Distress Ink to try and give it a bit more depth and definition of the individual petals. I used the Imaginesce Petal Roller tool to make the flower. Here's a closer look at the flower and its little pearl center. The Joy sentiment comes from Verve's "Glad Tidings" set. I stamped the medium snowflake in that set using SU! 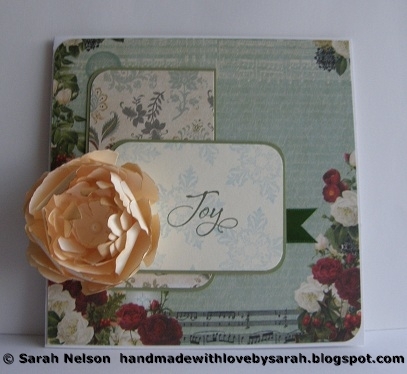 Bashful Blue and then stamped the Joy in SU! Always Artichoke. 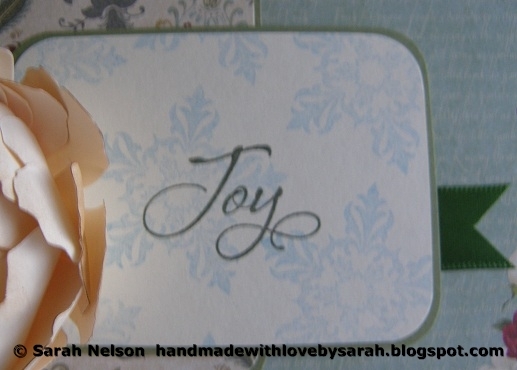 A bit of olive satin ribbon from my stash, and this card is done!